Interesting? Yes. Intriguing? Yep. Itty bitty? Correct. Intelligent? Also correct. 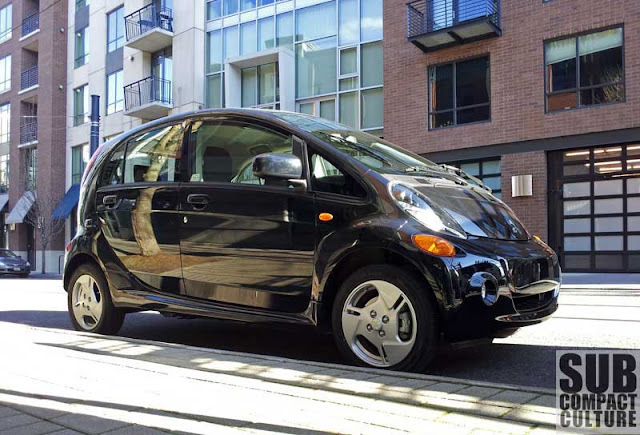 The 2012 “i” MiEV (Mitsubishi i zero emission, 100% electric vehicle) recently graced our driveway with its presence for several days. 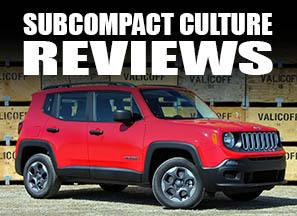 The fun, quirky, and extremely efficient four-passenger, five-door hatch-back consistently turned heads, whether we had it plugged in and charging at home, or were touring anywhere around town. 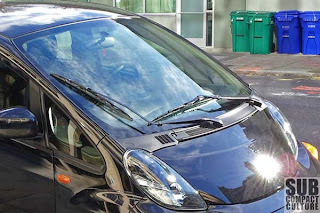 With a top mile range of only 62 miles per charge, we planned out several city trips for the week’s duration while making sure we stayed close to home, or within an acceptable range of several charging stations in the Portland, OR area. Very narrow 145/65/15 front tires. The i's gauges are easy to read. Intriguing is what I think of the i when I drive it. After you get used to the lack of engine noise when you turn on the car (because there is no engine), you have a choice of three driving modes to select before you hit the road. “D” (drive) is the maximum performance setting, in which the EV generates 100% torque in response to accelerator demand. “ECO” (economy) is the economy setting, in which it still has adequate torque for take-off and highway merging efforts, but the EV reduces battery consumption when driving in this setting by slowing its response time for ultimate demand. The ECO setting maximizes energy economy and battery life, while having enough power for cruising around. Lastly, there is the “B” (brake) setting, which is the regenerative brake setting. When you depress the “gas” pedal, the i has the same get-up-and-go as the “D” setting, but when you let off the throttle, there is an automatic drag felt as the car slows, engaging the brakes, therefore, making power to recharge the batteries. This setting augments energy recycling by generating power when not in full-throttle mode. So, the more you are off the throttle, or depressing the actual brake pedal, you are making more energy for your EV. Sometimes we moved from D or ECO and “downshifted” into the B mode, especially going downhill. Something to note is the slight gap in the car’s response when initially taking off from a dead-stop. The EV rolls just a tiny bit backward, before it moves forward, making it feel odd. Once you get used to it though, it seems like a detail that could be overlooked. The i has oddly shaped wipers. After taking off in this silent itty bitty city-slicker, you have an amazingly uninterrupted view out of every window. Well, except for one window, the front windshield. The driver’s side windshield wiper sits up further than I would like, but the real obstruction is the passenger’s side wiper. It is bent at a 90-degree angle from its base, and covers the entire passenger side of the windshield. An awkward detail, but the wipers are functional. With that set aside, the i is a fun cruiser on city streets. You sit low on the road, but sit high in your seat. The i feels less substantial than the Nissan Leaf in most regards. It is, of course, smaller, lighter, and less expensive. Acceleration isn’t quite as fast as the Leaf, either. It does, however, easily get up to freeway speeds, and will zoom along at 70+ if needed, but it’s much happier at 60 and below. 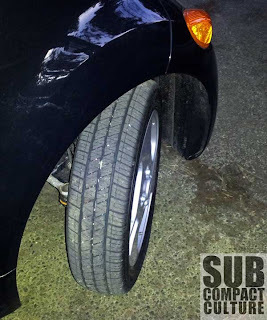 The steering is responsive but the car feels floaty when driven more spiritedly, and at freeway speeds dips and imperfections in the roadway cause the i’s suspension to feel jittery and unsettled. But let’s remember: this isn’t a sports car. The interior isn’t quite as nice as the Leaf’s, either. The seats feel thin; some plastic parts feel flimsy. Our test model’s dashboard rattles over small bumps in the road, although the gauges are simple and easy to read. A bit of irony to add: You see how much battery life the EV has left by how many bars are on the “gas gauge.” Yep, a gas gauge just like its gas-drinking cousins—there’s even a small digital gas pump icon with a plug instead of a nozzle. A few important things to note: The gear shift isn’t illuminated. 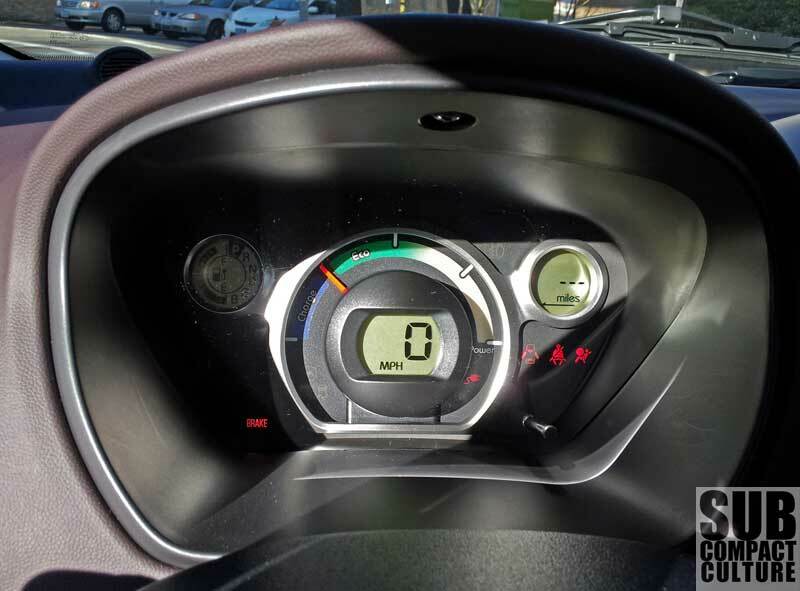 It was impossible to see what you were shifting the EV into unless you looked at the dashboard to see the tiny D, ECO, or B popping up on the digital display. Another thing to note: be prepared for a good amount of battery draw when using the AC or electric heater. The i’s heater works adequately after a few minutes, but I was a bit shocked to see how much the range was shortened and battery usage was lowered when using this feature; sometimes it was about 10 miles. That’s 1/6 of the entire range. However, the cloth driver’s seat is heated, and if used, the power doesn’t draw from the main batteries but draws from a separate, auxiliary battery. Smart. 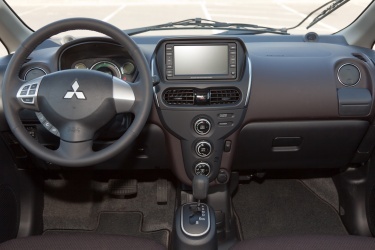 Intelligent is what I think of the Mitsubishi i as a whole. Retail MSRP on the base ES trim level is $29,125 with the upgraded SE trim level starting at $31,125. Our SE test model had additional features, such as a rearview camera system, quick-charge port, and navigation, making it sticker at $34,765. After federal tax credits, however, the net MSRP of the standard ES model is a modest $21,625, while the upgraded SE version starts at $23,625. Mitsubishi is offering the i for several thousand under its EV competition, making it appealing for a mass-market of eco-conscious consumers. Mitsubishi is offering an 8-year or 100,000 mile main-drive lithium-ion battery warranty; a 5-year or 50,000 mile powertrain warranty; and a 3-year or 36,000 mile bumper-to-bumper warranty and roadside-assistance plan. 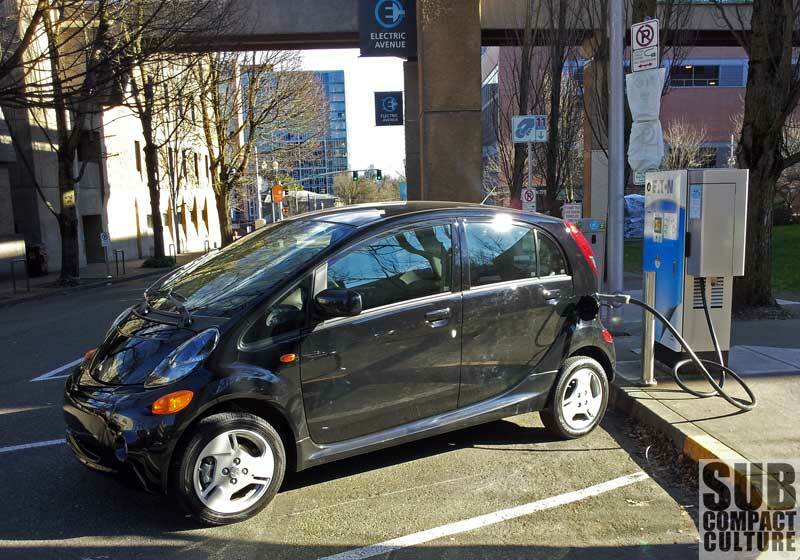 Using the Level 3 charging station at Portland State University's "Electric Avenue." The i comes with a host of safety and techy features, as well as three standard charging options (120V/8A Level 1, 220V/15A Level 2, and a CHAdeMO Level 3). We had a chance to stop by Portland State University’s “Electric Avenue,” a joint research and development venture between PSU, Portland General Electric, and the City of Portland, and charged up using their free Level 3 charging unit. Pretty cool indeed, and it’s the fastest way to charge an electric vehicle. Only tricky thing was we had to back the i into an angled parking spot to charge it as the station’s cord was too short and didn’t reach the rear-seated charge ports on our test model. No biggie at that location, but something to note. In tight spaces, those rear ports may not be as convenient as its competitor, the Nissan Leaf’s front-end port. Nissan placed both of their ports in the front of the car just above the bumper. Pull up, plug in, and have plenty of cord length to spare. Hmm, maybe a design detail to ponder for future MiEV models? There's no denying the i's unique style, whether you like it or not. City slickers, low-mileage commuters, downtown dwellers, and electric vehicle enthusiasts—this is an EV that’s priced lower than its competition, drives well, looks totally different, and is available within the 2012 calendar year. I would say, keep your eye on the “i”. I really feel like if they could get these in a lower price range, people would buy them. 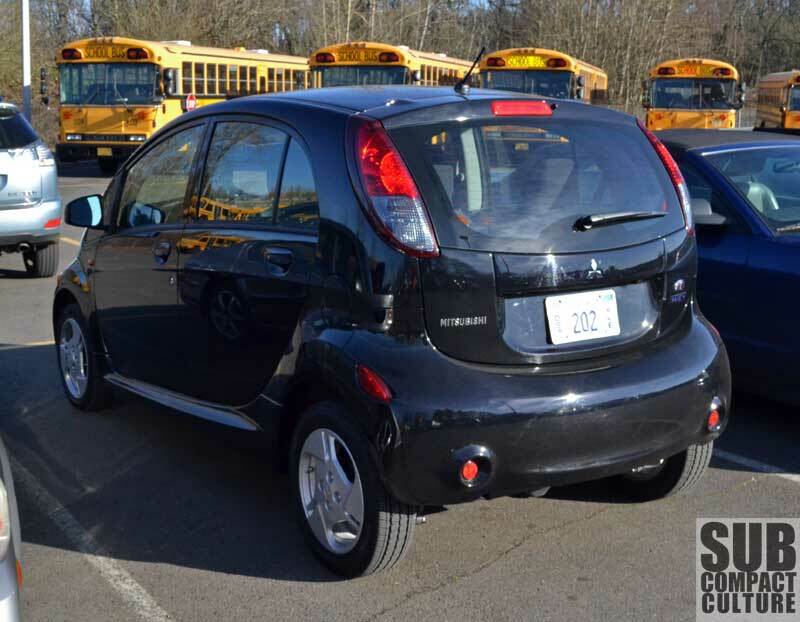 I think there's a market for electric small cars for short distance driving, especially in larger cities. 62 miles would be enough of a range here within Wichita Falls, Texas. I could even drive up to the casinos in DeVol Oklahoma AND come back with range to spare. But for 4 passengers, you could carpool in this and put a lot more change in your pocket after plugging it in. You could commute 15-20 miles each way every day with range to spare for errands. Much more than that and it's not quite enough. 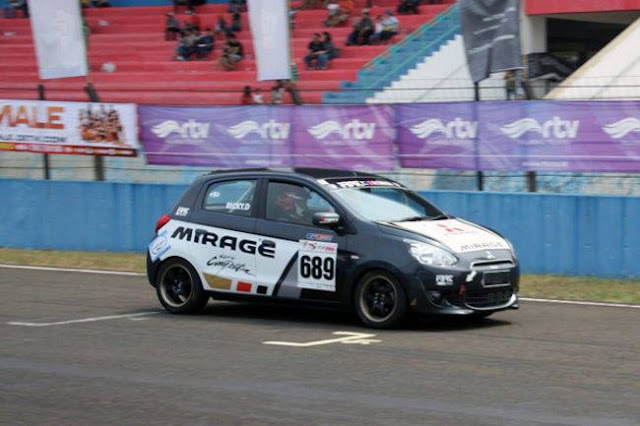 Mitsubishi is right to tag this as a city car, because out of town it's a brick. I do like seeing the option of 110/120V charging. Not every place in this country has 220/240V available! You can plug in one of these at a light pole at Wal-Mart, for crying out loud!